If you are interested in learning more about our exterior window treatment options, contact us for a free quote and consultation. We will do all of the work for you including installation. All you have to do is pick the style and colour scheme to suit the exterior design of your home. Contact us today to look at our available options and to learn more about our services. Do you need to shade an outdoor entertaining area to make it significantly more useable? If so, a Folding Arm Awning might be the answer for you. A Folding Arm Awning is a retractable blind system that comes out at an angle from the wall or mounting surface. They have numerous options and features and generally have a Canvas or an Acrylic fabric. They start at a very basic and economical awning - without a hooded cover, crank operation and no angle adjustment and can go up to a remote controlled, motorised, enclosed headbox awning with a good range of angle adjustment. They can also be set up for automatic opening and closing depending on the sun and wind. 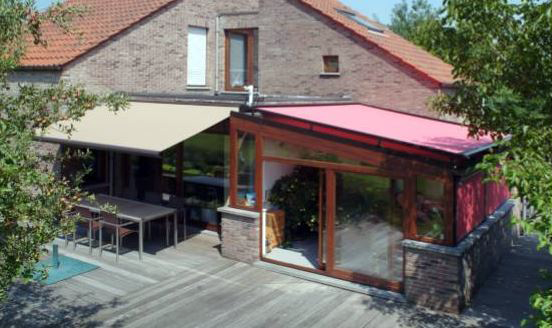 Folding Arm Awnings can go up to a massive 10.5 meter span with a 5 meter projection. Generally the width must be wider than the projection. We do carry one model that is specifically made for narrow areas where the projection can be more than the width. 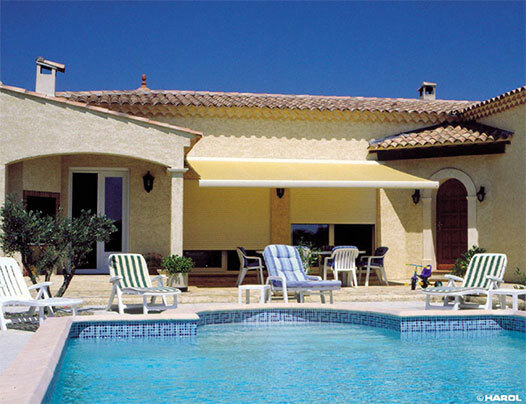 Fixed Pivot Awnings are generally used over a window to provide shade to the opening. They are mounted above the window and have a pivoting arm attached to the bottom bar of the blind. They are often cord operated so can be a very economical option for shading. They can be used on ground level windows and 2nd story windows. The fabric range includes both Acrylics, Canvas and Screens. They are a great product to reduce cooling costs and provide more privacy. The fabric is angled off from the glass which provides ventilation and stops heat buildup. This type of awning is designed to sit close to your window. Because they require less space than a Fixed Pivot Awning, they can be installed in areas that are narrow such as between your house and a fence. This type of awning has fixed guide rails at the side with self locking arms. They can also be mounted in channels. Fixed Guide Awnings are also mounted as an angled blind to the window leaving air space so that heat is not trapped between the blind and your window. They have a fixed metal rod on each side that the blind travels up and down on. The top of the blind is fixed to the structure of the opening and the bottom would typically be 150mm – 300mm out from the base of the opening. 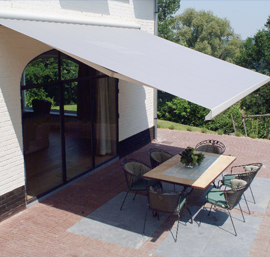 The Fixed Guide Awning has numerous control options – Cord and Reel, Spring and Pulley, Crank and Motorised. Suitable fabrics come in Block Out, Light Filtering and Screens. These are well suited to multi-storied buildings. The Drop Arm Awing is similar to the Fixed Guide Awning, however because of the compressed spring arms, it provides the flexibility to easily extend or retract the awning with the ability to stop at any point through its extension range. They are a great option for high wind areas. They can be mounted on second story openings, are available with Block Out, Light Filter or Screen and can be fully motorized. The Retractable Shade Blind is tailored to provide a simple, external roller type blind with a screen fabric. These can typically be made from about 900mm to 3800mm wide. Wider blinds incorporate welded joins in the fabric which provides a better look and finish. These are basically an up, or a down blind as they operate on a spring-loaded mechanism. When the blind is brought down, it is held in place by means of tonneau strap and button. These can be placed at various points between the top and bottom of the opening. This is your typical straight drop blind that you might see on a verandah or a balcony. It is operated by pulling the cord until the blind reaches the point at which you want it set, and then securing the rope around a cleat mounted to the wall. Hoods are available for fabric protection if required. 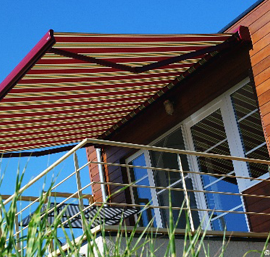 These awnings are an economical option for enclosing Verandahs, Balconies, Patio’s or Decks. Available fabrics include Canvas, Acrylics and Screens. The PVC Blind uses either a clear or a tinted PVC which blocks wind and rain while still providing a view through the blind. This is a heavy duty cord operated blind with optional lock down kits available. The blind rolls up from the bottom as the cord is pulled. Maximum width is 3500mm and maximum drop – 3000mm. These blinds can also be secured at the sides by zippers or tracking. PVC is prone to cloud over time. The Tensioned Vertical Drop Blind is very versatile with many available options. It is essentially a straight drop blind system with Canvas, Acrylic and Screen fabric options. It can be adjusted to any level when used with Stainless Steel side cables or Side Tracks. The bottom can be secured by way of straps, buckles or stainless steel clips. Hooding can be added where required and the blinds can be operated by Crank Handle or Motorised. Conservatory Awnings or Sliding Roof Systems sound like an unaffordable, complicated item! This is no longer the case. These awnings are designed so they can either be installed on the top of an existing structure such as a glass conservatory or they can be mounted against a wall with their own support structures including rain guttering and drainage pipes. They can cover widths from 2 meters wide to 5.5 meters wide with projections up to 6 meters, as a single unit. They can also be joined together to provide almost any width required. The roof systems are motorized with Sun and Wind Sensor options. The fabric can either be flat with a constant tension or can be folded (similar to a Roman Blind when raised). In years past Timbershades specialized in providing external, motorized Western Red Cedar Venetian Blinds. While this product is no longer available as most of the manufacturers who did these have taken them from their range, there is a replacement product made with Aluminium slats. This provides you with the same great 180 degree tilt, raising and lowering options of the Timber Venetians but in a more modern, light weight material. Aluminium as a material also provides the benefits of high radiation reflection and low radiation absorption and transmission, while also being very durable. Aluminium Venetians can reduce thermal heat by up to 93% which can help save on cooling costs.